April 30 (Bloomberg) — While the specter of Greek contagion haunts southern Europe, corporate Germany is going from strength to industrial strength. What is especially interesting is the way that the endless permutations on the original always bear – as if spectrally! – a little bit of the root sense of the original utterance. Crisis of capitalism, even when the recyclers of the trope don’t believe that such a thing is possible. One of the most fascinating pastimes available in the districts populated by those called, not inappropriately, bourgeois bohemians, is to try to figure out how the other people on your street make ends meet. The stakes are higher now than they used to be, of course. Families who had overspent themselves a few years ago were due nothing more horrible than a visit to the local refinancing outlet to jack their indebtedness from 90 percent of the value of their home to 110 percent and beyond. But with property values doubling over ever two years, what did it matter anyway, right? Now, of course, things are different. The easy cash for semi-solid collateral is mostly gone, only to return if and when the governments’ (both US and UK) ill-considered efforts to inject liquidity into the markets actually start to work… and in working, likely reinflate the bubble that is at the back of many of the problems that we face today. So when you’re idly speculating about your neighbors’ finances, you’re thinking dispossession and moving in the with parents rather than the semi-comical pyramid schemes of a few years ago. Serious stuff. Of course, this is an old story, one of the older stories about this sort of life and this sort of living. One would love to go back and interview Marx’s neighbors at 9 Grafton Terrace in north London to hear what they thought or guess about the whole freelance writing / Engels-funded operation. Once settled into the suburbs, Marx sometimes gave his address as Haverstock Hill, the main road linking Chalk Farm with Hampstead Village. 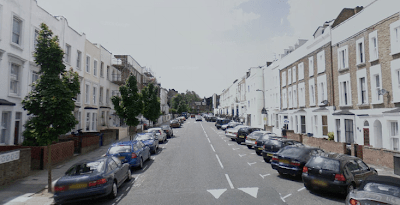 Today, as then, Grafon Terrace is still on the ‘wrong’ side of that road, being very much part of the working-class district of Kentish Town, rather than the middle class parts of Hampstead on the other side. She’s a translator or something, but I think it’s mostly piecework that she gets, not a steady job. She says that she wants to go back and get a PhD. They’re moving into a new place, but it’s small and maybe that’s why they don’t want us coming over yet. If only they knew. But yeah, he must be in business or something. She doesn’t really talk about it. The trick of it is, the serious issue at play, is that vast stretches of places like Brownstone Brooklyn and North London are populated by people who 1) have interesting jobs or non-jobs and 2) couldn’t possibly afford according to their actual salaries to live where and as they do. The bourgeois bohemia that is the proving ground and playing field of intellectual life at present age is funded by parents and debt, hubris and affluent upbringings. That’s the objective half of the problem. The subjective half has to do with stress and bills, aspirational enthusiasm and grief, as well as a general sense of the unrealness of things that comes along with living in a property worth something like a million dollars but worrying about the price of the latte that you just purchased. Marx’s house in Grafton Terrace, like so many of its kind, was rented. Because of the tendency of the building trade in London to overproduction, there was usually an abundance of new houses at quite low rents for middle-class tenants, and a glut of houses would bring rents well down. Thus, the Marxes paid only £36 a year in rent, in half-yearly installments, for a house with a rateable value of £24. Of the initial rate installment of £4.20, £3.20 was for the Poor Rate, 10p for the sewers, 20 p for the lighting and water, and a general rate for paving and other services. During this period the Marxes always paid their rates on time. She’s upset. Her book hasn’t sold and the agent’s been stringing her along asking for rewrites for like three years. I don’t know what he does – he’s working on a book about 1968 or something. He always wears that same suit, the Tom Wolfe hipster suit, yeah with the hat. They own their place though. Dartmouth Park, right by Parliament Hill. Three bedrooms or so. But she’s so broke that I paid for pizza last time we were out. But then she laughs when I tell her that we don’t own a car – she says that we should buy a used Volkswagen or something. 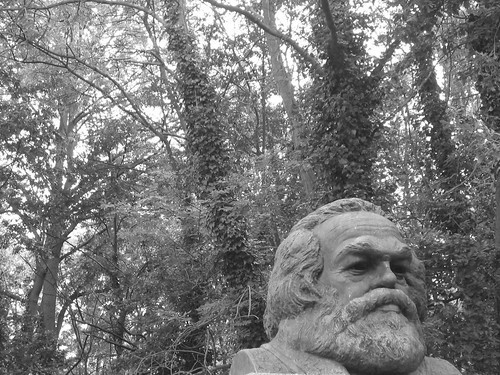 On Saturday, after many many visits to the adjacent park which is 15 minute away from my house by bus, my wife and I finally paid for entry into the Highgate Cemetery and visited Marx’s grave. It is starting to seem very significant to me, not in a personal way but in a personally-knowable way, that he did the work that he did where he did it and lived a life in north London that seems remarkably similar to mine, despite the fact that it all happened more than a century ago. One of the defining rhythms of our time, our time as lived by the notable technodrones who staff the Empire, is a rhythm that I’m very, very familiar with. It is the life-rhythm of having cash in the bank, yet not pulling cash from the machine so as not to walk around with money to spend… which in a city like this generally means spending it. In short, I’ve been able to live the life that I lead through a tenuous intermixture of moderate talent, extreme good fortune, and a certain amount of austerity. I think my experience of these mixture is more representative of a certain banally rarified way of life than, in the best case, it should be. So I’ll blog about that for the next week or so. Please understand that I am not asking for nor suggesting an ounce of sympathy for any of this. Quite the opposite. But it is symptomatic and waiting to be told.